Last year, we did a series of Monday Medical articles on albinism in cats. Since Maxwell and Faraday are temperature-sensitive albinos, this was a fun and interesting topic for me to write about. Temperature-sensitive albinism is what causes breeds like Siamese, Burmese, Himalayans and Tonkinese to have pointed coats - darker in the extremities and lighter in the torso. You can click here to read last summer's article about it. But did you know this albinism extends to eye color, too? 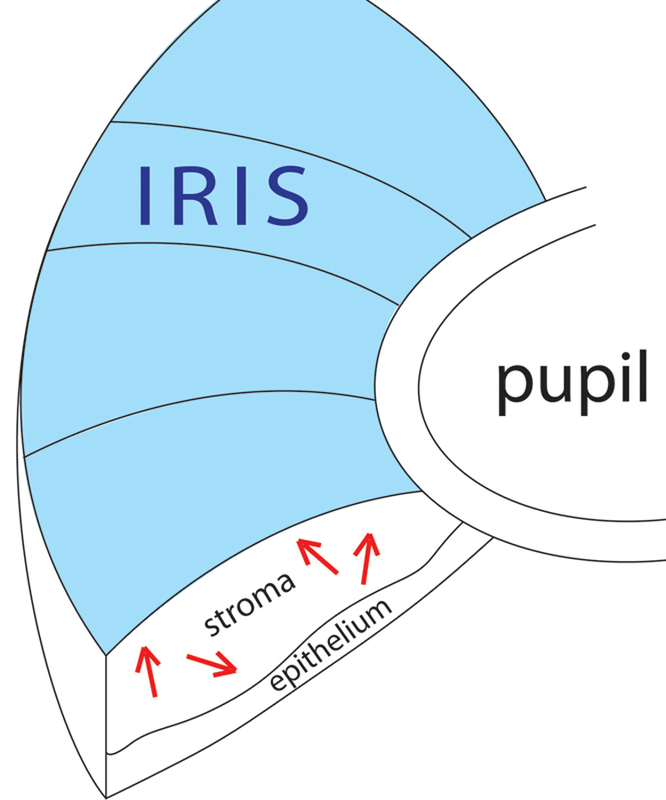 There are two layers in the iris of the eye that determine what color your eyes are (both in humans and cats) – the stroma and the epithelium. In most cats, pigmented cells are scattered throughout both layers. 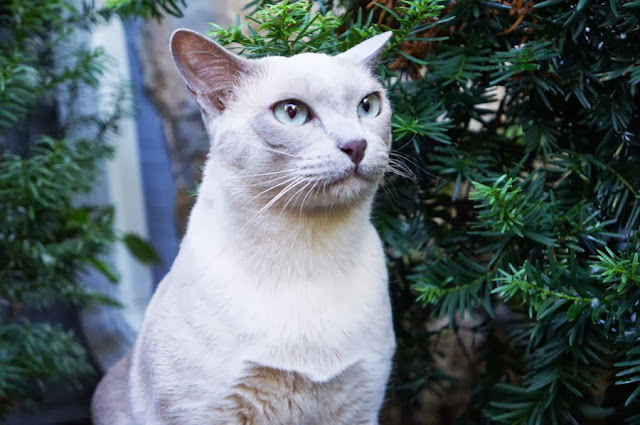 But for cats who have Siamese or Burmese alleles, (a gene pair that causes temperature-sensitive albinism) there is no pigmentation in the stroma. And, whereas other cat breeds with blue eyes have pigment in that lower epithelial layer, the blue of a Siamese is due to the absence of pigment in both layers. why do they appear blue? For the same reason the sky is blue. In really basic terms it has to do with the fact that, of all the colors in the visible light spectrum, blue has the shortest wavelength, and colors with shorter wavelengths scatter more than colors with longer wavelengths – it's called Rayleigh Scattering. Since blue light is the predominant light that is bouncing around in the stroma layer, that is the color you see (shown by the cool red arrows in the diagram above!). Faraday, on the other hand, as a Tonkinese, does have a small amount of brown pigment in his epithelium layer. So all that blue light bouncing around in his stroma is impacted by the slightest of tints in that epithelium. His eyes are technically classified as "aqua," though in my opinion, they often appear to be sea-green in color. So there you have it, folks. Siamese cats: living out the answer to the age-old question of why the sky is blue. Oh, and yeah. We think it's pretty cool that all this came about because the boyz are albinos! "Ocular pigmentation in white and Siamese cats", Invest Ophthalmol Vis Sci. 1980 May;19(5):475-86. Thibos LN, Levick WR, Morstyn R.
Those are very informative facts. 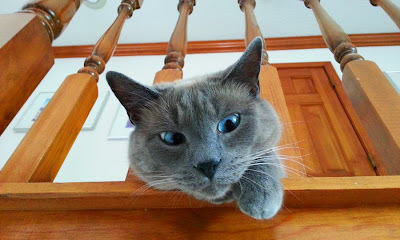 Our Himalayan, Angel Cerise, had the most beautiful blue eyes. so what happens that creates odd eyed kitties? WOW - interesting. Thanks for sharing. @Tails from the Foster Kittens OOH! OOH! We know that answer!!! It's the same reason some white cats have blue eyes! Odd-eyed cats have the white spotting gene, and it's mapped across that eye. Often (but not always) the surrounding fur near that eye will be white, and you can trace where the spotting gene has blocked all pigment, both in the eye and on the skin and fur. 30-40% of odd-eyed cats are deaf in the corresponding ear, too. Cool facts..... But you forgot to add Ragdoll cats and Snowshoe cats. My Ragdolls have the most BEAUTIFUL blue eyes! Ps: Ragdolls' eye color is called "Killer Blue". I love reading all these cool facts! Along with lacking pigment in her eyes, I think Boodie lacks some pigment in her brain... my human says she is not the brightest bulb here! I had the hardest time explaining why my white cat did not have blue eyes--and was not an albino! White is not necessarily albino, and albino is not necessarily white! But the boys still have beautiful eyes. That is very interesting. Guess it works in dogs too. I have always had Australian Shepherds and a lot of them have blue eyes or one blue eye and one normal eye. The ones that have blue eyes have a lot of white color in their furs. Now that you've told us why the sky is blue, can you tell me why I always see red with I look at Waffles? Wowzzers! That makes me extra special too! Auntie Bernadette, you're right - white cats aren't albinos. All- white cats who have the "S" - or spotting gene - usually have yellow eyes. And one big monster "spot" covering their whole body. MOL! And all-white cats that have the "M" - or masking gene - are the ones who have the blue eyes. But they technically aren't albinos. Uhm, we're thinking maybe it'd be fun to bring back the post on "White Cats, Star Trek and deafness" for next week. THAT was a FUN one! You are really good at explaining this stuff in an approachable way and making it fun! Our mom loves blued eyed cats. Her first, Attila, was white and his eyes flashed red. Because his father was a meezer, he wasn't deaf. He could hear a can of food opening across the house! Well, whatever the rhyme or reason, we have always thought the boys' eyes were GORGEOUS....along with the rest of them!! I LOVED this just as I did about coat color! Love it. we love your science posts. we had the one blue eyed white foster kitten named Doc that was deaf. fun to know the "why"